A crowd of 17,102 – just 638 short of a new world record – saw France lead from start to finish and beat New Zealand 30-27 in another enthralling classic encounter that even bettered the game of the previous week. 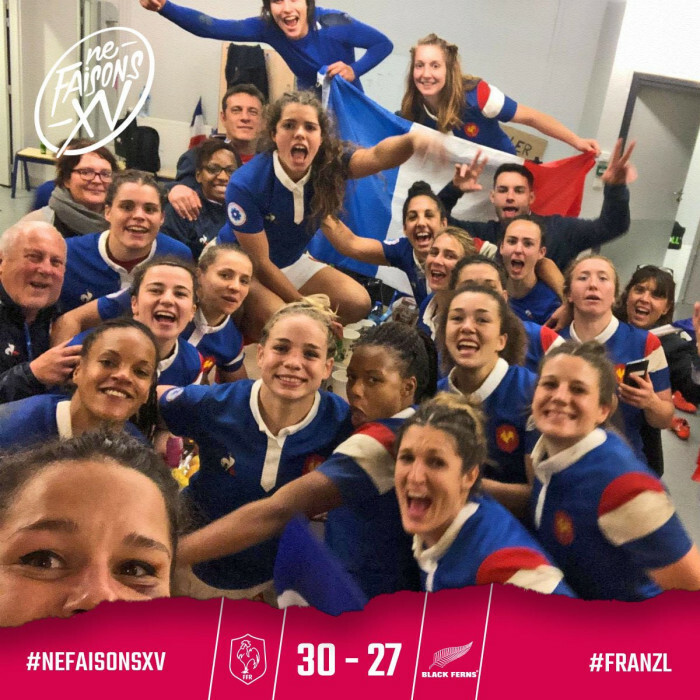 One of the greatest women’s test matches ever played ended today with a deserved 30-27 win for France against New Zealand at Stade des Alpes in Grenoble. Despite transport difficulties, the second largest attendance for a women’s test match (just 540 short of the mark set earlier this year for France v England) witnessed – and contributed to - a titanic battle between two of the best sides in world rugby (they may even be the top two when the new rankings appear on Monday). France opened the scoring through Julie Duval soon after the start, but a Stacey Waaka try soon levelled things before French brilliance resulted in two tries in a couple of minutes. A brilliant team try, completed by Maëlle Filopon, was second later capped by a dazzling individual try from Romane Menager, who first showed terrific hands juggling and retrieving a difficult pass, while at the same time breaking the Ferns line and winning a 60m footrace to the line. Suddenly with half an hour gone France were 19-7 ahead. But the Ferns battled back on 36’ with a try from Fiao’o Faamausili – once inside 5m the Ferns were irresistible all game - to take the teams in at 19-14. Ian Jason’s chase to a loose ball was counted as no try soon after the restart, but the disappointment was soon forgotten as brilliant work by Corson set up Drouin for France’s fourth try. 24-14. But four minutes later the gap closed again. A perfect kick ahead by Waaka gave the Ferns a lineout on the French 5m. The ball was worked quickly down the line and there was Winiata to pull the Ferns back. With Coksedge’s faultless kicking New Zealand were back with three points. And a few minutes later Coksedge’s boot was to the fore again, converting a penalty to tie the scores at 24-24 with 26 minutes to go. It was anyone’s match now. But crucially a minute later Ruahei Demant received the Fern’s second yellow, Drouin converting the resulting penalty to put France back ahead 27-24. With ten minutes to go Drouin was on target again, extending the lead to 30-24 – only to see Coksedge return the game to a three point difference almost straight from the restart. And so to a final ten minutes where first France absorbed Ferns pressure, before using their scrum – on top throughout the game, and series - to turn the game around and spend the final few minutes firmly at the Ferns end. The Ferns finally got hands on the ball in the final seconds, but could get no further than the French 10m line before being turned over and spark huge French celebrations. *Back at the 1991 World Cup France beat New Zealand 3-0 in a hastily arranged and very unofficial "third place" match. The game appeared - and possibly still appears - in French records (caps were awarded), but not in anyone else's. New Zealand rugby history ignores the game completely.